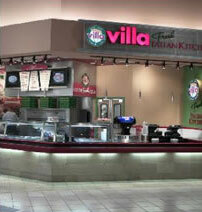 Villa Pizza franchise business opportunity. Free Villa Pizza business franchise information. What started in 1964 as a tiny pizzeria next to the Ed Sullivan Theater in New York City has grown into an international organization with over 300 locations and 5 restaurant concepts offering an array of flavors and tastes pleasing to most every consumer. 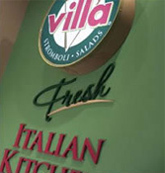 Villa Pizza, our flagship concept, was the vision of our founder Michele Scotto. When Michele came to <?xml:namespace prefix = st1 ns = "urn:schemas-microsoft-com:office:smarttags" />America, from his homeland of Naples, Italy, he dreamed of opening a pizzeria where he could continue to practice the craft he had learned back home working in the restaurants and cruise ships in and around Naples. As a franchisor we have a high awareness of industry trends as well as an understanding of what needs to happen at the store level on a day to day basis to succeed. Site Selection - Villa will provide site selection training to help you identify the most opportunistic location. Currently, we operate in the following locations: malls, airports, casinos, hospitals, street locations, colleges and universities. Lease Negotiation - Our leasing team is here to assist you with your lease negotiations. Restaurant Design - Our design and construction department provides you with guidance from drawings to the final punch list. Villa University - Villa University provides 3 weeks of intensive hands on training at our national training facility. When you become a Villa Enterprises franchisee you're not only joining an experienced restaurant company with over 40 years of growth and success. You're teaming up with a partner who is supportive and dedicated to your success. To learn more about the Villa Pizza franchise opportunity, simply complete the form below.